Illustrating the Yankees penchant for training away prospects in the 1980s, The Dallas Morning News noted in 1991 that the only four of the players who had won the organization's top minor league pitcher or position player award since 1980 were the only ones who hadn't been traded. "And," Maas told The Morning News that June, "most of the other guys were in the big leagues with other teams." Three of the four Yankees prospects still in the system also made the majors. One of them, Todd Malone, did not. Malone started his career in 1988, taken by the Yankees as their first pick in the draft, but in the fourth round, out of Casa Roble High School in California. Malone started his career in the rookie Gulf Coast League, going 6-1 in 12 starts. He also posted a 1.64 ERA and won the Yankees' top minor league pitcher honors. He moved to short-season Oneonta in 1989. His ERA, though, ballooned to 6.45 in 18 outings, five starts. 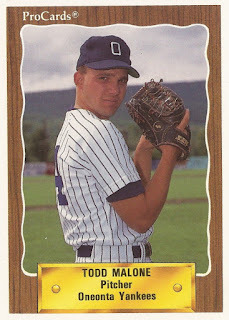 Malone got his first full season in in 1990, playing between Oneonta, single-A Greensboro, and high-A Fort Lauderdale. Between them, he went 7-8, with a 4.40 ERA. In seven starts, though, at Fort Lauderdale, Malone went 0-5, with a 5.45 ERA. He took is fifth loss in late August, giving up seven runs in one inning. 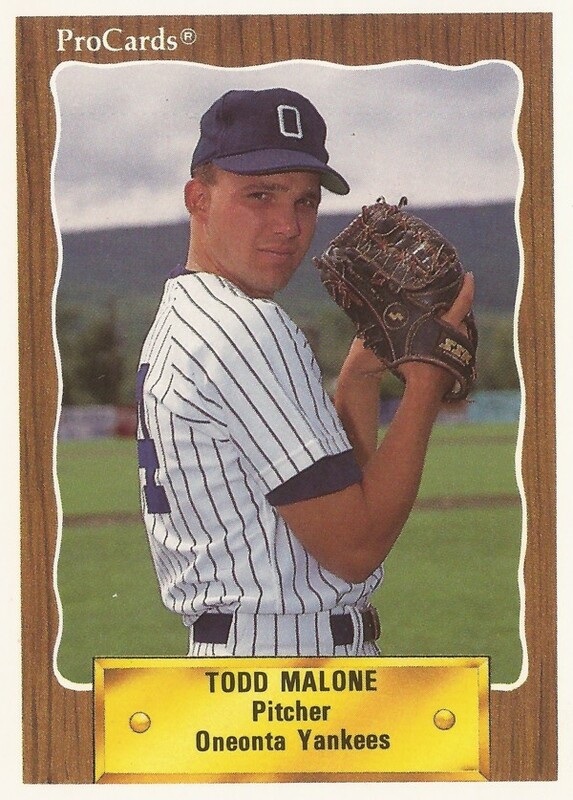 Malone played 1991 largely back at Greensboro, as a reliever. In 25 outings there, he got no starts. But he did give up just 10 earned runs in 44.2 innings of work. By 1992, Malone was back in high-A, at Prince William. He went 5-5 in 33 outings, six starts. He posted an ERA of 6.10. Malone's final season came in 1993, at independent San Bernardino, ending with a 3-9 record and a 7.03 ERA, without making it to AA.